Tips To Improve Your Sim-Racing Skills Explained By Experts. Tips To Improve Your Sim-Racing Skills Explained By Experts. It requires full focus and concentration with proper training and experience. Obviously, it is not a rocket science but as it said that practice makes a man perfect, holds true for this also! As far as racing basics are concerned, they all are more or less same for every game. If one focuses on working on some key areas, nothing can stop him from becoming an online race champ! Want to be next Greger Huttu, consider the following points. It makes sense to use practice areas to improve your driving skills but most of the people let that go waste. Quick races or time trials can help you in making all the adjustments which you will be requiring in your actual race. This is free of stats and one can practice as much as he wants to before hitting the main tracks! For a better grip on the road, it is important that you have adapted pretty well to steering sensitivity. One second confusion in the race will lead to a crash in no time. The only way to achieve this feat is by driving your car slowly on both the right and left edges and gradually increasing the race till you think you have become perfect! For a successful driving, one should know when and how much acceleration and brake to apply. These both tools go hand in hand. Try to apply brakes only on turns and learn to ease off the accelerator during open turns to avoid braking unnecessarily. Once you learn to do this, you can minimize your braking and increase your acceleration throughout your game. It is important that you adjust your hardware to your relaxation. Make sure you have wheels and pedals to support your driving. Try to adjust the seat, pedals and shift to perfection, helping yourself to get a better grip while driving. Apart from this, adjusting screen size will also be very helpful and can affect your performance in a big way. The best way to improve your racing skills is by learning each and every detail of the track. When you will do this, you will have a clear cut idea in knowing as to what is coming ahead in the track and prepare you mentally for it. It is advisable to master one track at a time, practice hard for perfection and then move forward to the next one. 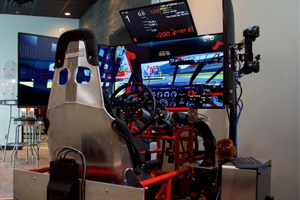 If you are facing any problem regarding your racing skills or want to purchase some exciting sim-racing products, feel free to call Simulation1 in Markham. We will guide you in improving your racing skills with the use of our best featured sim-racing products! Call us to know more about our products and services! What Are The Benefits of a Driver Simulation Program?